#106. 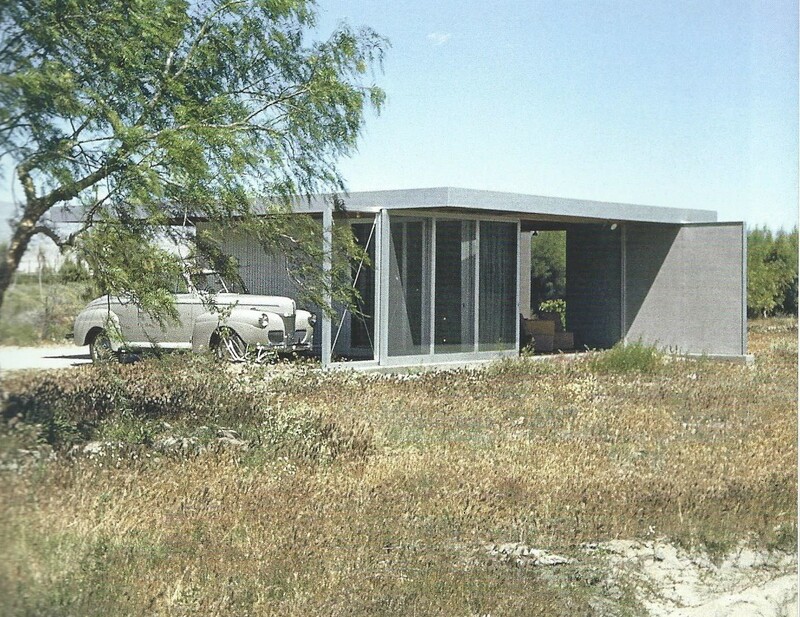 Robin Greenwood writes on Albert Frey, the Seductions of Mid-Century Desert Modernism and the Disambiguation of Sculptural Spaces. Albert Frey, 1903-1998, was a Swiss-born architect who lived and worked mostly in California, where he had a long career designing modernist houses and various commercial developments. He started out as a young man in Paris in 1928 on a kind of internship in the office of Le Corbusier and Pierre Jeanneret, a period he regarded as highly significant to the development of his own architectural practice. He worked on parts of the design for the Villa Savoy and other projects, but didn’t stay long and soon applied for an American visa. 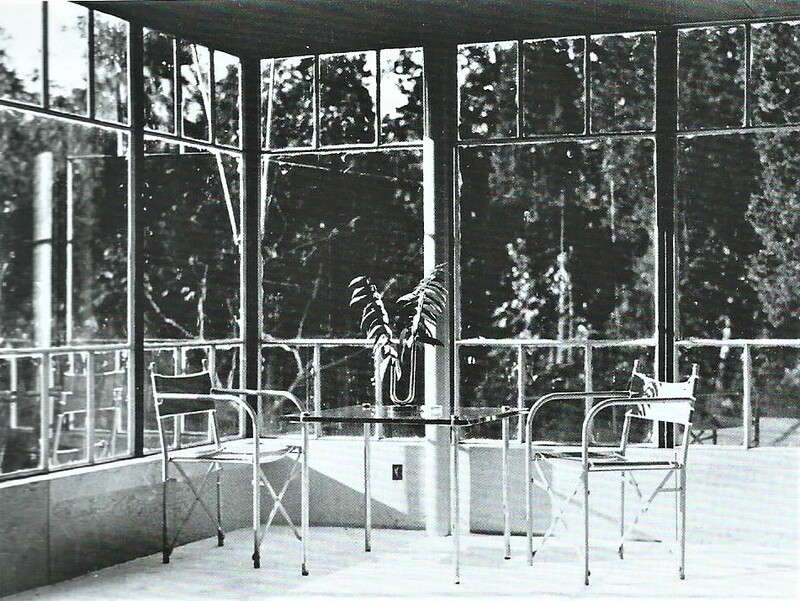 By 1930 he was in the New York office of A. Lawrence Kocher, and together they designed Frey’s first major work, Aluminaire (1930-31), originally sited in Syosset, Long Island, a prefabricated and idealistic structure of the first order, with influences from the Villa Savoy project, but also recognised at the time as having some true originality of concept. 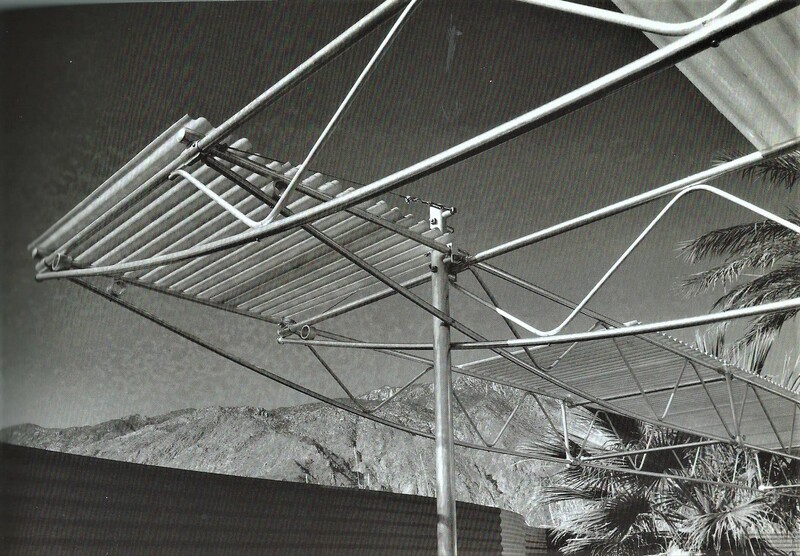 It established Frey’s reputation as an innovator, but a serious career supported by architectural commissions had to wait until 1934 and the design, again with Kosher, of the Kosher-Samson Building in Palm Springs. In between those two projects was the extraordinary and beautiful Kosher Canvas Weekend House, of which more later. 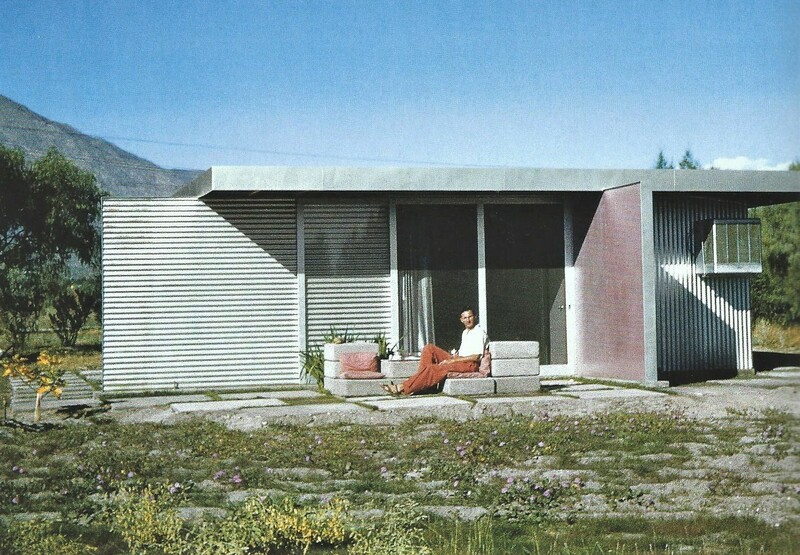 By 1940 Frey was designing his own house in Palm Springs, Frey House I, in a semi-desert environment, where the integration of the spectacular Californian landscape with the paired-down structures of modernism became perhaps the most significant characteristic of his work, as exemplified by Frey House II. I became interested in Frey by accident when in the late nineties I picked up a second-hand book of his architecture, a slender minimal volume bound in pale pink that had great pictures and few words, and a rather compelling poetic aesthetic: (https://www.amazon.co.uk/Albert-Frey-Houses-1-2/dp/1568981902). At the time I was into all sorts of modern architecture, engaged with the design and build of my own rooftop project. And although Glenn Murcutt’s zinc-louvered long-houses of the Australian outback came to be the defining influence on my little project, Frey’s work kept its resonating attractions, not just because of my architectural interests, but also because of where I’d come from as a sculptor, how in my early days at art school I had become excited by the means to shape new materials into extemporised spatial forms with fresh imaginings, free from the last post-war knockings of dated academic subject-matter. Unlike sculpture, architecture has a long and viable history of making the creation of inventive spatial structures central to its discipline. Sculpture had until the sixties very little that was noteworthy in relation to that freedom. Though I came to his work late, I saw a personal link with Frey in this liberty and the close connection between new ideas and new materials. “Aluminaire”, Albert Frey and A. Lawrence Kocher. Frey’s Aluminaire building began as a project for experimenting with and showcasing new mass-produced building products, and an early model of the design was carted around suppliers and manufacturers to drum up support and sponsorship of construction supplies, such as the five-inch diameter aluminium pipe columns that supported the whole structure of the two elevated levels, which were, though derived from Le Corbusier’s piloti, the first of their kind in America. The whole thing, as the name implies, was sheathed in aluminium sheeting. 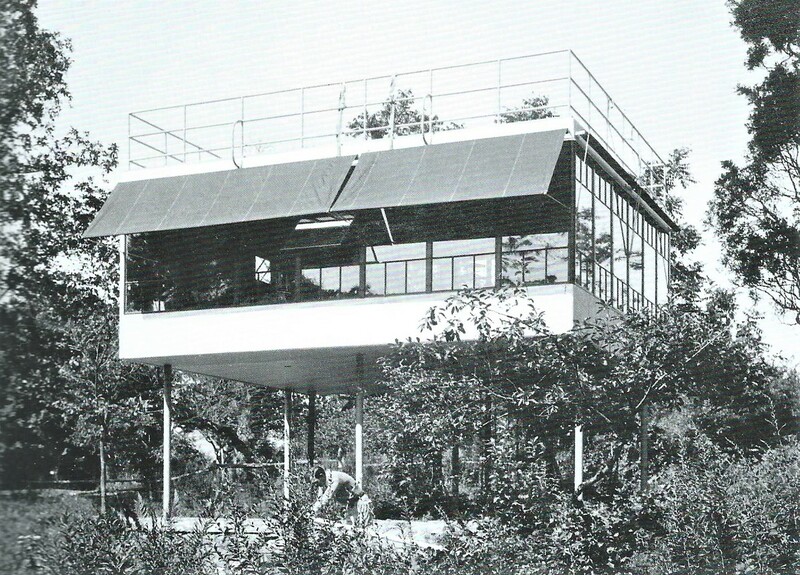 View of the terrace at “Aluminaire”. 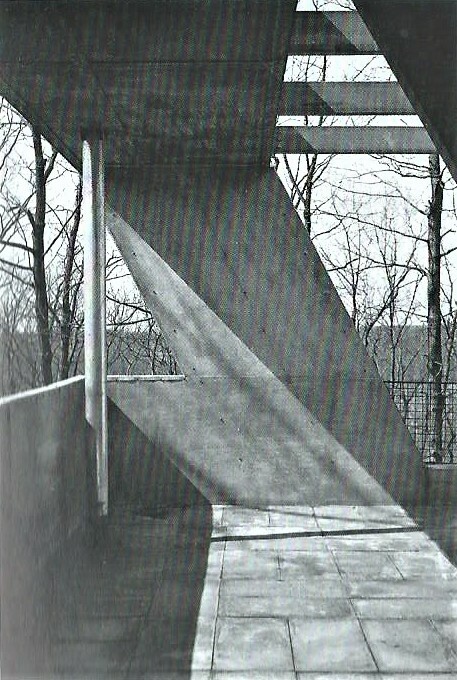 So who can resist the geometric perfection of this precisely-composed image of the Aluminaire roof terrace, where the calibrated light and shade look like something straight from the black and white chronicles of a László Moholy-Nagy constructivist photo? If there is already a strong hint of the esoteric aesthetics of impractical indulgence, then so what? Whilst it lasted it was so bloody handsome. And there’s more to come. 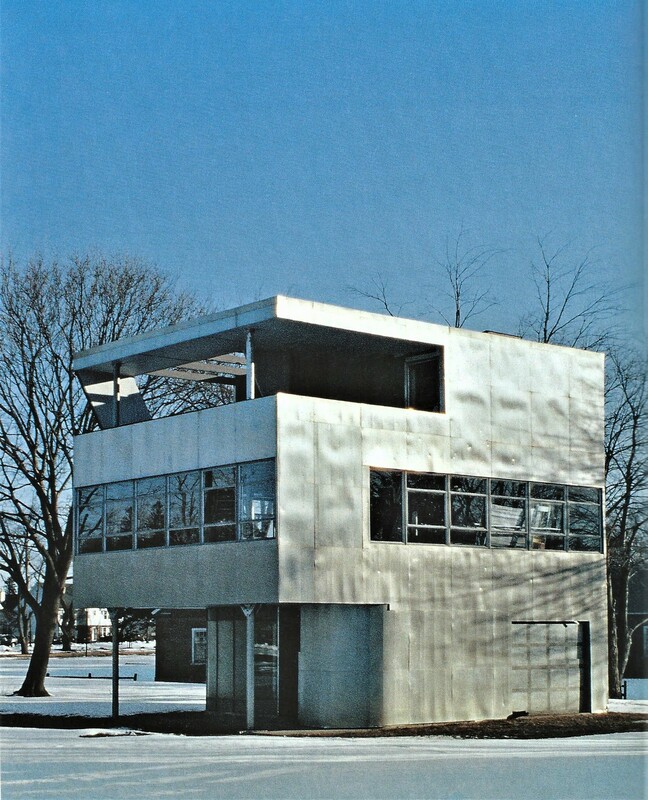 But Aluminaire was only rather briefly used as a dwelling, and had its practical problems, as was the way of much early modernism. It fell subject at the last to a harrowing and peripatetic history, ending up as a carefully catalogued set of parts in a museum storeroom. Frey’s second project fared a little better. The simple and sublime Kocher Canvas Weekend House survived as a much-used and loved retreat until 1950, before being demolished. The whole house was covered in marine canvas, with the intention of proving cotton as a viable low-cost construction material. It was built on a coastal site on Long Island, and had three levels. The lower level was open, with all the living quarters on the middle floor, and a roof terrace of the top, accessed by a spiral stair. A photo of the living quarters shows the inspirational open aspect of the high windows, looking like something straight out of a light- (and colour) filled Matisse studio. What a life! 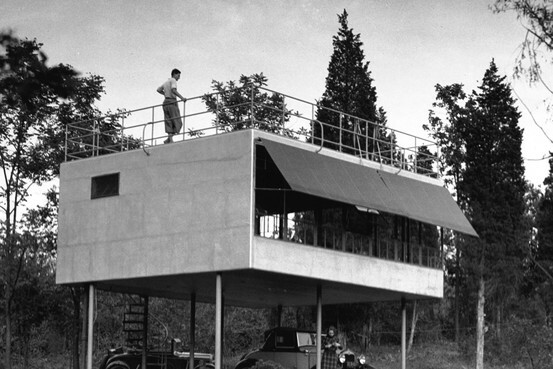 “Frey House I”, 1940, west side with car port. Lovely! Thanks very much, I’ll have the natural dry garden, and the beautiful car in the beautiful car port too! 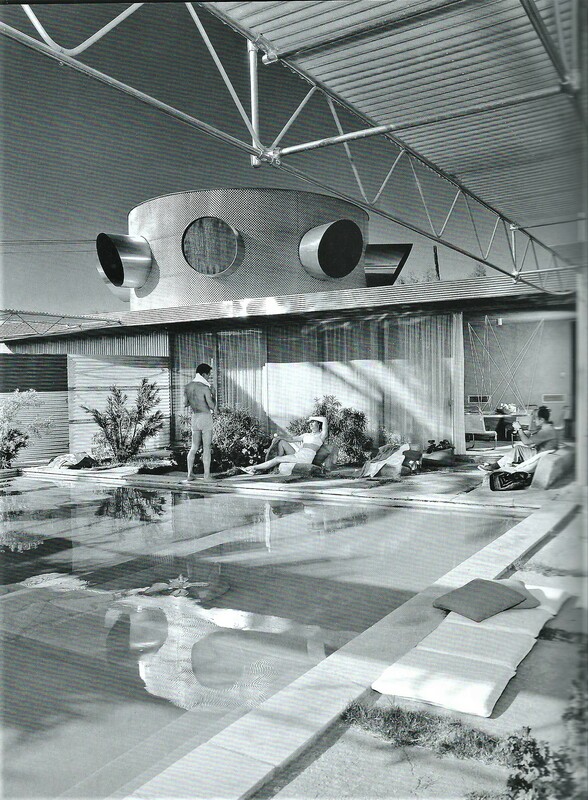 In 1953 Frey remodelled the house with a circular second story, a pool, and a very different expressive aspect that gets into something very unlike the pure Miesian structure of the original – but still I love it. How about these expressive and shapely trusses round the pool, topped with plastic sheets? So here we are, we have arrived at transcendent architectural spatiality, made with modern materials of steel, aluminium and plastic, and we’re floating free! With the help of engineering structures of poetic design, and the essential additions of blue sky, blue pool, cacti, rocks and mountains, we enter a place of almost mythic inhibitions. This is the life, and no worries! Some ten or fifteen years later, abstract art in England would take on a little of this delight and intoxication, in the forms and shapes and colours of, firstly, the sculptures of Anthony Caro, coming straight out of his own links to new architecture and the International Style – notably the Smithsons (Alison and Peter); then, hot on Caro’s heels, the New Generation artists. That’s where I come in, as a student in 1966, poring over the latest art mags with images of something new and very different from anything I’d seen before. I love these sculptures by Tim Scott, the Bird in Arras series. 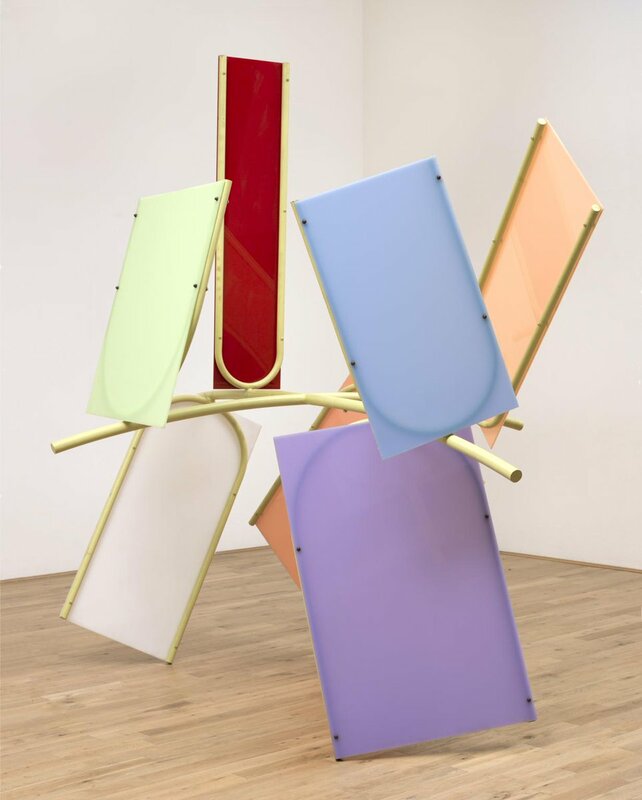 They went further than even Caro did, perhaps even further than his Early One Morning and Prairie, in the activation of a free-flowing, open, colourful vision of constructed space very closely linked to aspects of new architecture (which Tim had studied). They triggered the complete involvement of the viewer’s own room-space. They have a clarity of vision and scale, allied to a straightforwardness of means, which make for very direct engagement, particularly if the viewer is clued up to the ways and means of modern life. If you get these works, you get them straight away. And like the Frey houses, if you like them, you like them straight away. I liked them, straight away. They make high art out of tubular metal and plastic sheet, and all looked to be going swimmingly at the pool-side. Space, light, scale, colour; what’s not to like? I recall ogling dreamily the architectural models of houses by Mies van der Rohe and Le Corbusier some years ago (was it the Whitechapel or the Barbican? Have I conflated two shows? ), thinking they were the most exquisite spatial objects ever made, superior even to all the new (or old, for that matter) sculpture that I knew of, with beautiful massing and even most beautiful detailing, opening into and out of deep and crafted architectural spaces of the first order. Here was clarity, here was spatial expression, here was the beauty of unfettered orthogonal forms in coordinated combinations – a dream indeed, until my more practically-minded companion asked: “But where’s the bloody kitchen?” As already mentioned, the practicalities of living with early modernist houses are notorious. Unless you want to live on take-away pizza and diet Coke, that was always the problem with the early Frey houses too. Check out the plans of the Kocher Canvas Weekend House and the kitchen appears to be a stunted affair jammed awkwardly behind the front door. New sculpture didn’t have the same problem, but a different one. There is an analogy, though. Just as living on pizza with no kitchen is a bit unsustainable, even if charming for a while, and when added to Coke and booze is a recipe for obesity; so sculpture cannot live long and prosper on the pared-back diet of steel tube and flat plastic, even if nice colours are included. Even if the sculpture is a great hit for a short while, it doesn’t last as an experience in the round, or in time. Now we know – sculpture needs more aspects, more time, more complexity, more everything. It needs not only the ACTIVATION of space, that Caro and Scott in the seventies were adept at (and that architecture could always do so well); it needs too the ARTICULATION of material – moving and modelling and pulling and pushing, and so Tim Scott, along with a lot of other people, got into the forging of big lumps of three-dimensional steel in the eighties; and still in the end that wasn’t enough either, and in any case endangers the ACTIVATION of space that had just been won from architecture. 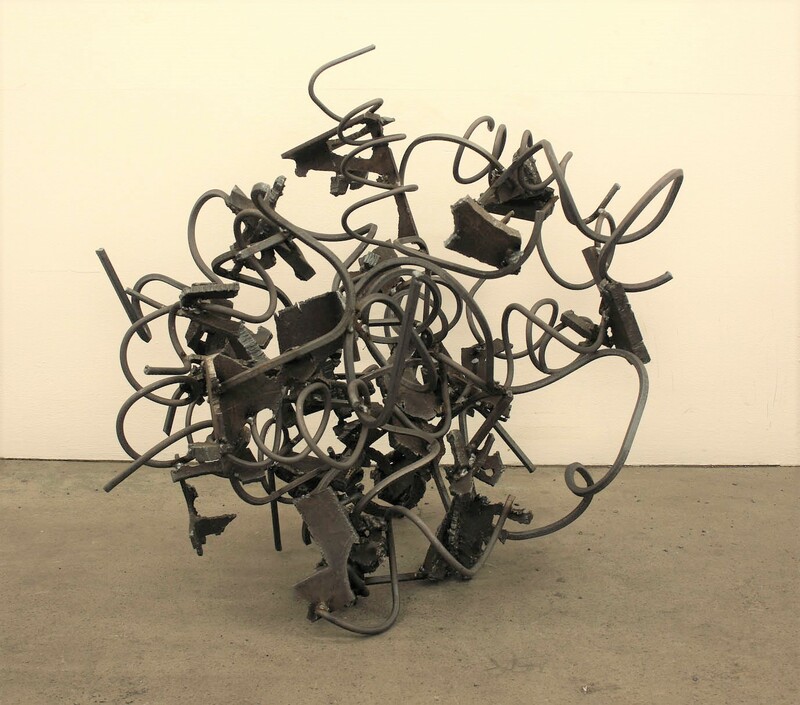 Sculpture needs not just spatial activation, but the full, three-dimensional ARTICULATION of space. This articulation needs to be at close quarters, in proximity to the material, bound together with the articulation of the material… but don’t throw out the baby with the bathwater. Keep the excitement and freedom of the sixties, but add to it more stuff. Put all those three things together – the spatial activation, the material articulation, and the spatial articulation, and you have something very different from anything architecture can do, something completely intrinsic to sculpture that no other discipline can do, and something sculpture has never done before. And potentially compelling. Keep things open, but invest in complexity. A varied diet, not too much of the same thing, not too much of anything, mostly vegetables, as they wisely say these days. Architecture and art have to adapt to embrace sustainability, have to become wise to the realities of a finite world after the heady intoxications of Aluminaire and Bird in Arras. But the spirit of those early modern works is fully worthwhile integrating into new and cleverer ways of making activation and articulation, physicality and spatiality, work together as intrinsic elements of a much more sustainable, long-lasting, fully nourishing artworld. 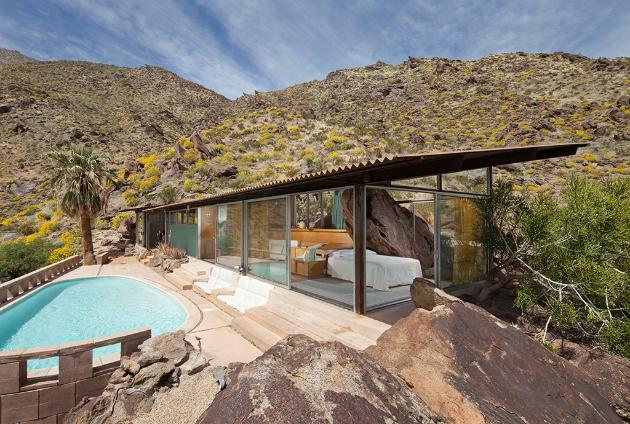 Postscript: In 1963-64 Albert Frey moved out of “Frey House I” and built himself a new house 220 feet up in the mountains outside of Palm Springs, “Frey House II” (illustrated at the top of the article). It was sited on rocks and included a massive boulder half-way inside the living quarters. Already in his sixties, Frey designed it all, supervised and even helped build some of it. He lived there until he died aged 95 in 1998. Way to go. Thanks for introducing this amazing architect Robin, Mark J and I really enjoyed your piece of writing and images. Shame one can’t build quite like that in this country. The simplicity and clarity of design works so well in a barren landscape. The linear quality in your sculpture seems very different from other works I have seen, Robin. I enjoy the central mass but am wondering about the ‘springlike’ form releasing the energy on the top/centre of the sculpture. I feel bad making a judgement on just one photograph, but the coil feels a little too evenly formed. It looks an exciting way of working though, I can see parallels to JB’s collage work (I have said this before I know). Thanks for your comment, Noela. The new sculpture is very much a work in progress, but it feels in a small way like I made for myself some kind of updated connection to something from the sixties – that freedom of spatiality that I get out of both Frey and Tim Scott’s early work, albeit with an added understanding now of how to articulate space in three-dimensions rather more. We will see where this goes. One of the things that has changed since the time I started making abstract sculpture is how the idea of complexity has been taken on board. If fact, it is only in the past few years we have taken to discussing it as a positive value – you can see it now openly and commonly discussed in some of the recent Brancaster films. I’ve been writing essays about it since 2011 on abstractcritical and thinking about it for even longer – and still am. In the sixties and seventies the ambition was for simplicity and clarity, and that was pretty much the whole story. But I now think you have to distinguish between simplicity and banality, and likewise, between complexity and complication. I still think that a certain kind of simplicity is a valid aim, but the achievement of real simplicity is often a complex business. As I’ve asked before, is a Beethoven piano sonata simple or complex? Well, it might depend upon which sonata you are listening to, but they all have aspects of complexity that add to their expressive totality, even the early ones. When you get to opus 111 or the Hammerklavier things really are truly complex, no question, but still strive to achieve a wholeness of some kind unheard of before in music. Distinguishing between simplicity/banality, complexity/complication are key to creating any work that has a chance of having some visual meaning. Ps. or sonic, like you say. Simplicitly has much more of a place in architecture than it does in visual art. All over complexity in architecture would be visual overload. Feelings of visual overload when looking at an art work can be as a result of an overcomplicated chaotic mess, although it can also be because work of complexity is still rare and difficult to look at. But why should a painting or sculpture be an easy look? That isn’t very ambitious. This really raises the crucial, but often overlooked, question of what role does a scupture or painting have? Work with minimal visual content can look ‘cool’on a wall, perhaps in a modern architectural environment. It may echo simple colour schemes and structures of architectural design but in itself what value does it have? I think a work of visual art should ‘stand out’ both for its meaningful and engaging relational content. Of course it might not go with your decor. Lol. Indeed, change the curtains! Here’s one of my favourite buildings. 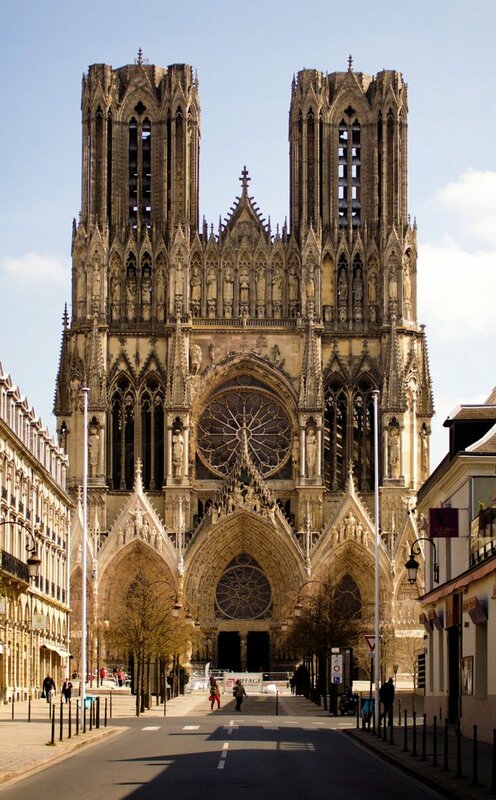 Reims cathedral. Simple or complex? Yes, unless you adore your curtains more. But I wouldn’t want that kind of even balance and patterned repetition in a work of visual art. Well… I think I might. There’s a lot I’d do to make a work as powerful as this. Bit hypothetical though. You would need an even bigger studio. Robin – I agree with you on Frey. 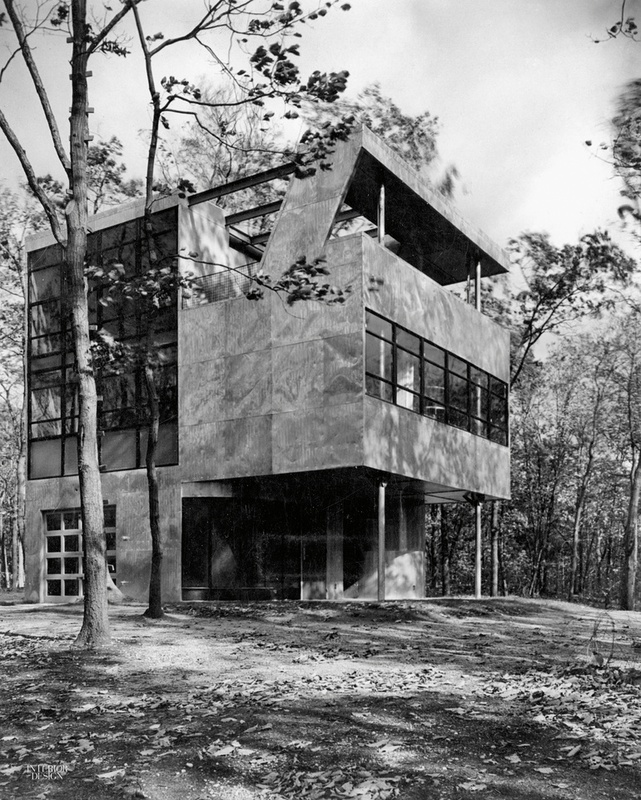 I have a feeling I read somewhere that he had a big influence on Eames when he (Eames) built his ‘catalogue parts house’ in the Forties. 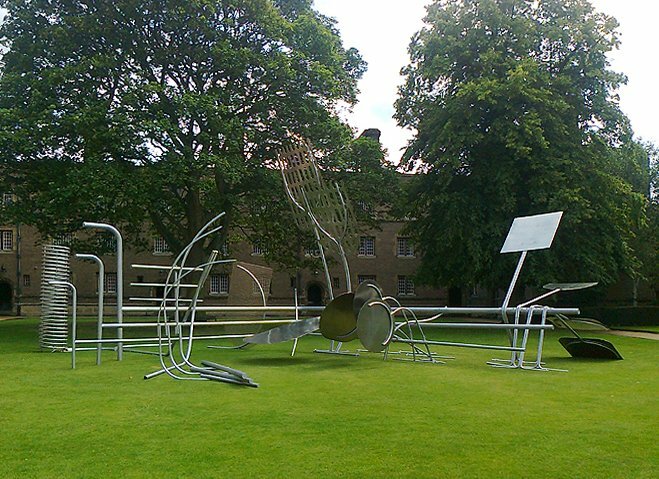 In my own work I have been thinking about this articulation / activation of space in new sculpture for quite a time. Perhaps one of the answers is scale. I have not had the resources to make a large scale sculpture,(over life size), in recent years; but anything life size or under has a tendency to ‘objecthood’ which undermines the input of imaginative spatial construction. How wonderful – I was turning my computer on with the intention of sending you an email to let you know I’d mentioned you… and there you were! So would you, in an ideal world, work bigger again to get the spatial activation thing back stronger? I do too, the rear end of it. When I saw it a couple of years ago they had just cleaned the outside and it looked stunningly good. And VERY complex… and simple, yes! 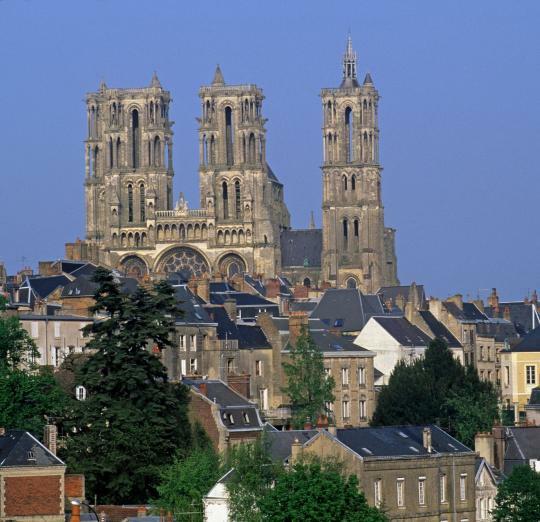 …but somehow it does not have the same integration of complexity with simplicity as Reims. It’s still fantastic, but ends up as something of an oddity. 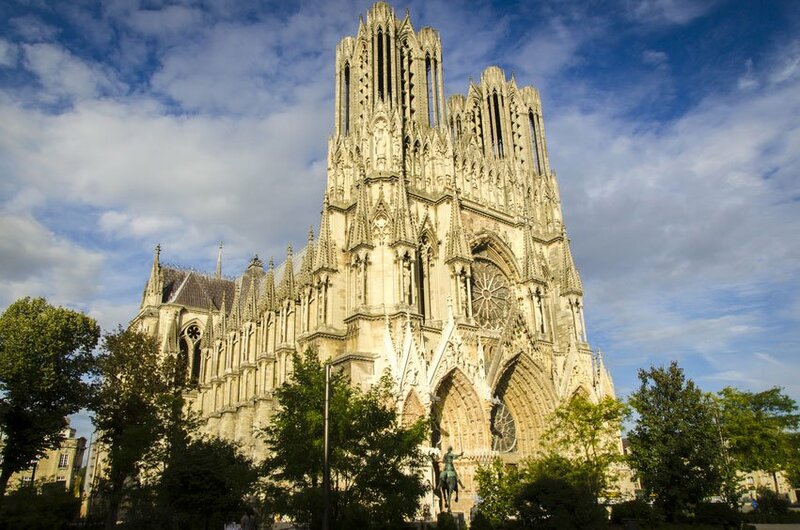 Reims remains full-on spatial expression all the way. I think I would rather go for clarity with complexity than simplicity with complexity. Yes, I still like diversity although I wonder whether complexity necessarily involves diversity? That is, you could have what some might think is complexity, as in an overall, detailed and repetitive patterned work, but the patterned element is, in a sense, simple not complex. Personally, this relates to my problem with some work where the discrete content is similar in some ways, could be colour, size, etc. This can become repetitive and uninteresting and unambitious, for me. However, the alternate problem is where discrete separate content is widely different and where internal relationships suffer as a result. This might sound wordy and abstract but it pretty much summons up my own ongoing struggles with both my own work and the work of others. Some examples would make it clearer where it is you are coming from. This can seem a little theoretical, but I think it is worth talking this through. 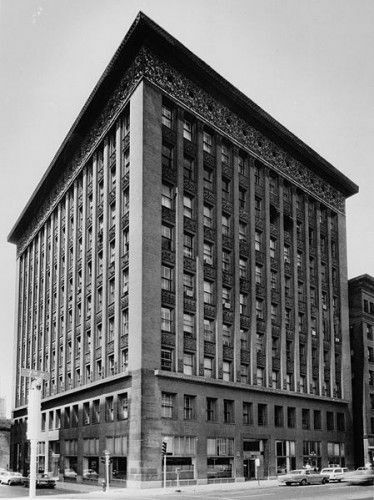 Another favourite building – Louis Sullivan’s Wainwright Building of 1890-91. Compare to this streak of Shard from god knows when. What happened to detail and structure, simplicity and complexity? Yes, sorry Robin, I still have problems with IT. 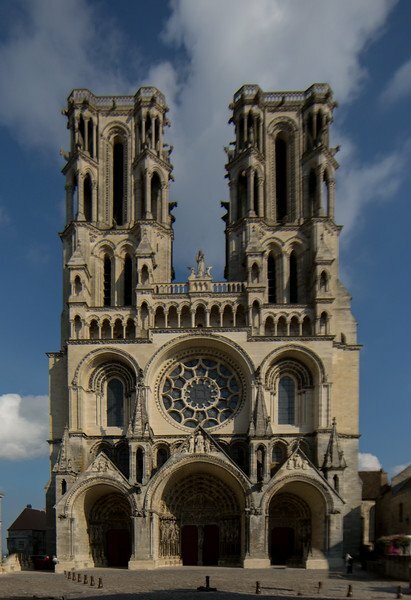 To answer your question; without getting into the world of Rheims, – yes. If you imagine a space of say 6 ft. x 6 ft. x 6 ft., it is approximately the space we inhabit as a physical body. 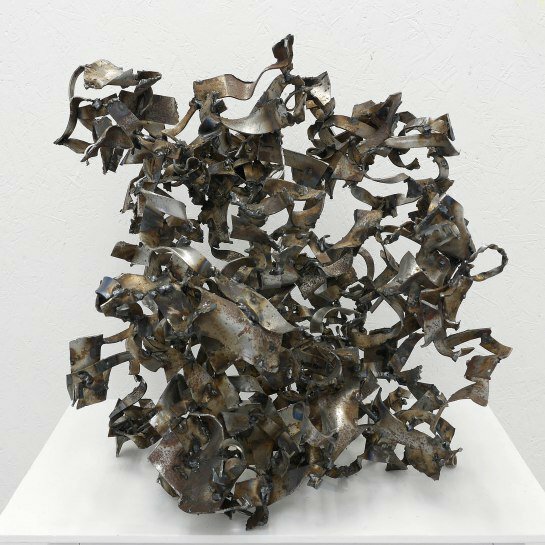 Sculpture, which largely exists within that space, as a spatial and physical body in itself, is perceived by eye and only marginally affects it physically. If you go beyond that space you become peripatetic and your perceptions are altered accordingly. If sculpture goes beyond that space, it too becomes peripatetic in perception such as the ones of mine you quoted,and the nature of sculpture’s ‘visual extension’ becomes enlarged. amalgam beyond what has been achieved before. The dangers are of course to do with confusion with architecture, engineering, and other physical / spatial structures which are NOT sculpture. How to do it, as always, is the rub. All those things that are “NOT sculpture”, there’s the rub, as you say, and we don’t even know what all the things that ARE sculpture are. Robin – Yes quite – but orthodoxies are only orthodoxies, and are surely up there for questioning at any time. I suppose my own illustration are the sculptures at Jesus you helped with, that were a world apart in looking at totally differing answers to ‘sculpture’, but nevertheless part of the same search. There is, I agree, a large physically difficult resolution to be faced between working for a new kind of spatial world in sculpture and its existing status, as so far achieved, with abstract plastic form and structure (and size).The ‘non sculpture’ issues continuously get in the way of seeing more clearly plastically. and certainly making more clearly a structure that can truly be sculpture and nothing else. I mention the scale issue as a possible avenue of development, but am aware that it is in danger of negating other equally sculpturally necessary ‘values’ which can be dissipated as a consequence. Architectural form, and materials, have the enormous advantage of a built in necessity engendered by structural and functional forces which they cannot avoid. Sculptural form and materials, on the other hand, have no such ‘necessity’ (gravity apart), but must have it induced into them visually. This, if achieved, makes the prospect of success exciting and convincing, but dangerously teetering on the verge of superficiality. An excellent comment, Tim. And despite the sub-title to my essay, the disambiguation of sculptural space still seems problematic – perhaps more so now that the articulation of space has been added to the mix of spatial activation and material articulation. I was rooting through a big pile of photos from the past twenty years of work in my studio, chucking some stuff out, but also seeing the potential of a million different ways things might have proceeded, but were never progressed – or even seen – at the time. I think it’s very good to reassess all these past ways of thinking about things. As has been said a few times recently, the imperative now seems to “get all the balls in the air”, trying to get lots of aspects of sculpture working together at once – and we still seem to be adding a new “ball” every now and again, or maybe just re-discovering an old one. The thing is, to return to your original point, the important thing is not to allow any of these solutions to settle into orthodoxies. Sculpture will remain bigger than any of our current ideas about it. 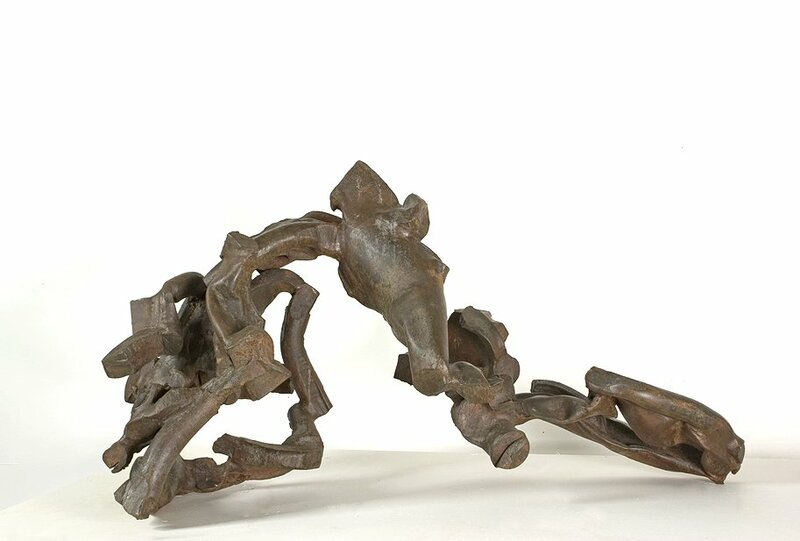 Robin – To take your example of Tony Smart’s sculpture as illustrated (I haven’t seen it in the flesh); suppose one were to expand it to a life size, or more in scale, it would immediately become apparent that much would have to change physically accordingly. The relationships of parts to the whole would enter a new world as the spatial relations of these expanded. It would probably require a rethink of the actual parts themselves, their forms and even the materials they use and how it is handled. It could even be that other material or at any rate very much altered existing material has to be introduced to sustain a new vision of ‘form’ that makes up the whole. the spaces created by parts would in turn demand further adjustment and (since their ‘visibility’ would be greater) a much more positive role in the perception of the structure as a whole. The created ‘structures themselves would be subject to a different ‘reading’ not only from the eye but from movement around and even into them. This would indeed drastically change the density, compactness and ‘closeness’ of the existing sculpture to the point at which it no longer says what it was intended for it to say, and is saying something else of a different order.On the other hand it might add to it ? At any rate one could say that at the very least it would extend the spatial range that the sculpture occupies and that this in turn would become a more dominant integral of the sculpture. I am not suggesting that all sculpture should now start to be larger or enormous; merely that experimentation might be useful ? This article forms a pair with a previous one by Robin (#32 on Content and Continuity). I’ve sensed a gathering clarification in many articles and subsequent comments about the nature of making abstract art but these two articles form the spine of this clarification for me: getting the spontaneity into the finished work rather than the process and achieving a complex openness in doing so.